The UK Defence Science and Technology Laboratory (Dstl) has awarded a contract to NSC to develop and deliver a ship-mounted general-purpose machine gun (GPMG) simulator. Under the contract, NSC simulation experts will develop the simulator with a synthetic environment to enable Dstl to explore ways of enhancing maritime skills. 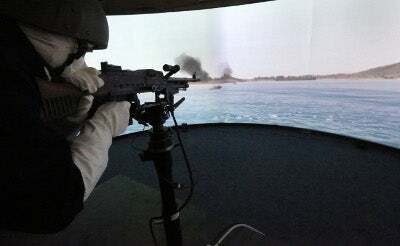 Based on Virtual Battlespace 2 (VBS2) technology, the GPMG simulator will be used in trials to examine new training methods for the Royal Navy and Royal Fleet Auxiliary personnel. Additionally, the simulator’s three-metre radius curved screen will expose operators to a realistic training environment to engage simulated targets. With compressed air, the GPMG simulator will provide a realistic tactile feedback, while the hidden electronics keep track of the weapon’s movement during training. The portable simulator will be designed to simulate scenarios, ranging from protecting against threats such as small, fast-moving vessels and supporting anti-piracy missions to port-based security operation. To affect visibility and weapon performance for users, the system will also provide options for environmental factors such as weather conditions, solar glare, surface reflections and spray all. Initially developed for the US Army based on lessons learned from the field in Iraq and Afghanistan, the VBS2 offers battlefield simulations that will help provide realistic, integrated basic combat training for units. The VBS2 Army fielding suite comprises 52 laptop computers, headsets with microphone, optical mice, steering wheel controllers and a projector for post action reviews. Image: A GPMG simulator. Photo: Courtesy of NSC.